Encouraging visitors to get hands-on with science, family-friendly events will travel to Cowdenbeath Leisure Centre on Saturday 27 and Sunday 28 May and The Lomond Centre, Glenrothes on Saturday 3 and Sunday 4 June 2017, offering four free fun and inspirational days for the whole family to enjoy. ‘A Day in the Life of …’ will kick-start each festival weekend and shed light on the many, exciting career opportunities within Fife, with the chance to meet and mingle with University of St Andrews scientists, as well as those working in engineering locally. These inspirational events will be held in Cowdenbeath Leisure Centre and The Lomond Centre, Glenrothes on Saturday 27 May and Saturday 3 June respectively. Meanwhile, ‘Science Adventure’ will let visitors explore the challenges in designing train stations, witness live demos of medieval combat, learn about boat-building and investigate their own anatomy! Get to grips with electric engineering, and discover how psychologists study how children think and learn. 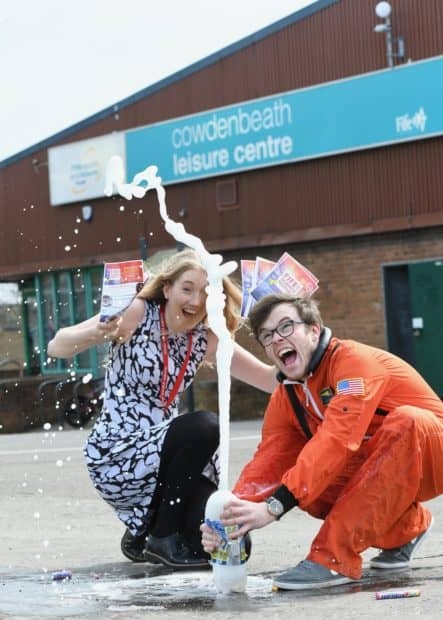 You can experience these amazing activities at Cowdenbeath Leisure Centre and The Lomond Centre, Glenrothes on Sunday 28 May and Sunday 4 June respectively. Fife Science Festival will culminate with a ‘Meet the Expert’ event at Dundee Science Centre on Saturday 10 June 2017, with free tickets available to Fife locals. Can’t wait to get a taste for science? Head along to science busking events with Dundee Science Centre’s team ahead of the big family events 11am – 3pm on Saturday 20 May at the Green Space, Cowdenbeath Town Centre and 11am – 3pm on Sunday 21 May at Kingdom Shopping Centre, Glenrothes. Brought to you by Dundee Science Centre and funded by the Scottish Government, Shell UK, Edina Trust and Fife Council, the annual festival will offer a diverse range of free activities for the general public. Note to Editors – Fife Science Festival is managed and coordinated by Dundee Science Centre and funded by Scottish Government, Fife Council, Shell and Edina Trust.